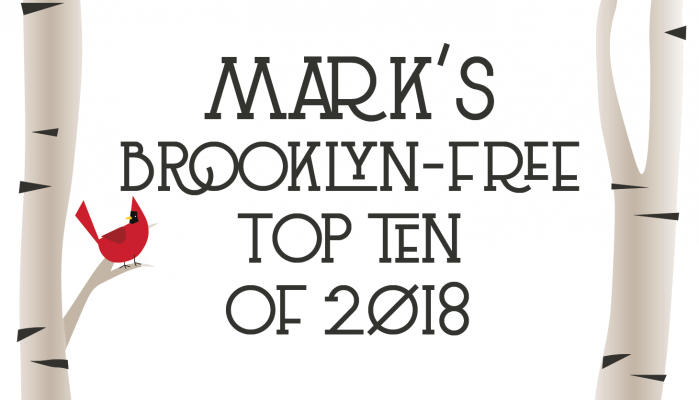 The guidelines are simple: no book in my top 10 books of 2018 can have been conceived of, written, revised or edited in the borough of Brooklyn, New York (either in its entirety or piecemeal). The authors of these highly exemplary works can’t currently live in or have lived in Brooklyn during the creation of these works. The books on this breathtakingly astute list can not cite Brooklyn as an inspiration or an influence in their work and, furthermore, Brooklyn, even fictionally, can not be a location in the book, nor emerge in any of the character’s dialogue (even passingly); furthermore Brooklyn can not be referred to, hinted at, or implied as a location. These glorious and peerless authors cannot have parents, siblings or any direct relatives currently living in Brooklyn. Relatives by marriage will be considered on a case-to-case basis. As with any credible list there are provisions. Provision 1: Said author wrote said book in Brooklyn during a residency: In this instance the book may be included, as long as the author swears they did not enjoy Brooklyn and regrets having accepted the residency in the first place. This statement of regret must be signed and notarized (said notary must not live in Brooklyn or be licensed in the state of New York). Additionally, it helps the author’s case if their permanent residence is as far from Brooklyn as possible (more than a day’s drive, different time zone, continent, etc). Provision 2: If research on said book was conducted in Brooklyn, New York the book can be on the list as long as the research conducted in Brooklyn was expunged and thus never made it into the final, published book, a book, as I’ve stated, that does not in any way pay homage, describe, flatter or chronicle in any way Brooklyn, New York. Provision 3: For translated works the translator can not have lived in Brooklyn during the translation of said book. If the translator was in Brooklyn for a translation residency, then refer to Provision 1. I love this novel. I have been assured by both Rodrigo’s publisher, Chad Post of Open Letter, as well as Mr. Fresan himself that not a single sentence, word, even comma of this incredibly inventive, pyrotechnic and genre-bending book was conceived of or written in Brooklyn. I called Mr. Fresan by phone and though he admitted to having been in Brooklyn once (2014, book launch, dinner following) he ‘didn’t enjoy it very much’. Will Vanderhyden, the translator responsible for this absolute gem of literary narrative, assures me he did not translate any part of the ridiculously original and fever-inducing THE INVENTED PART in Brooklyn. His affidavit sits before me and it’s an exercise in austerity. Will takes his translation duties as seriously as this list. Good on him. Did Esther Kinsky visit any of the rivers that flow through her spellbinding novel RIVER? More importantly though, did any of these rivers happen to flow through the borough of Brooklyn? Luckily for us the places exquisitely written about in RIVER are located in England, Israel, Canada and other locales in Europe. Even when the narrator of this masterclass in melancholic nature writing makes it onto American shores the rivers discussed aren’t even in New York! This absolutely incredible book hovers on the vague and ineffable borders of memory and time, proof that a novel can be almost entirely devoid of plot and still capture the imagination. Essay, memoir and fiction blend seamlessly into a book of quiet and profound beauty. The translation is stunning too; each chapter a meditation on memory, experience and the world around us. Esther Kinsky, unlike Jonathan Safran Foer, does not and has never lived in Brooklyn. Probably the most intense and visceral reading experience I had this year. Similar to Ferrante’s THE DAYS OF ABANDONMENT, this brief and claustrophobic novel follows the mind of a woman as she spirals into madness and rage. I was assured that the absurdly, almost offensively talented Ariana Harwicz had never stepped foot in Brooklyn, New York. However, days from finishing this list a rumor reached my ears which haunted my waking hours and stopped me in my tracks: supposedly Ariana Harwicz, author of the singular and almost obscenely vivid DIE, MY LOVE was seen walking the streets of Williamsburg in 2011 (the year she wrote the novel); in fact, several witnesses reported seeing her. Had she not signed my affidavit? Had she not pledged with the sincerity of a saint that she had never once stepped foot in Brooklyn? What was I to believe?! Whom was I to trust?! Promptly I removed her name from the list as I began investigating the matter. Luckily through due diligence (and the assistance of a retired detective based in a city that’s not Brooklyn) I was able to establish the photograph upon which the hateful rumor was based and we can all breathe easy: it was merely someone who slightly resembled Harwicz in the photo (an opaque black & white showing the offender entering an unnamed smoothie establishment). This case of mistaken identity allowed me to happily restore Ariana to the list. I was already an enormous fan of Guadalupe Nettel before reading her most recent book, AFTER THE WINTER, in English. Somehow, it’s her best book, with more depth and breadth than her masterful story collection, NATURAL HISTORIES and fictional memoir, THE BODY WHERE I WAS BORN. Focusing on two relationships, Nettel shows us the fragility of our lives as well as the arbitrary nature of love. Filled with sadness, longing and a gorgeous sense of place (Paris and Cuba among them) Nettel exposes the physical and emotional borders of life, love and longing. Although Nettel promoted AFTER THE WINTER in New York and parts of the novel take place in New York, Brooklyn is eschewed entirely and this, if nothing else, is proof of her genius. What is a Palafox and what does it look like? Reading this book will only confuse you more; it has antlers, feathers, scales, an enormous wingspan and can camouflage itself into the background. It can fit in a person’s palm yet weighs two tons. Does this sound ridiculous? Well that’s because it is. Innovative, hysterical and turning corners at every bend, this was my first book from the French author who is as rewarding as he is difficult. Incidentally, Palafox was not in any way, conceived of or written in Brooklyn. In fact, reading the book one doesn’t think of Brooklyn or even the existence of Brooklyn but is adrift in a world where Brooklyn doesn’t exist, a world, dare I say it, richer for Brooklyn’s non-existence. Several Palafoxes were once mistakenly spotted in Williamsburg but they were later discovered to be two members of The Strokes. Additionally, Palafox was translated by the brilliant Wyatt Alexander Mason in a place other than Brooklyn. My next book is the wonderfully original and inventively deceptive ELEANOR by Anna Moschovokis. Thankfully (thankfully!) Anna does not live in Brooklyn, New York but (by our good fortune) lives and works in an entirely different part of New York that is, not only not very close to Brooklyn, but doesn’t rhyme with, resemble or carry any relevant kinship to Brooklyn besides, of course, being in the same state as Brooklyn. Trust me, I did the research*. Anna, by the skin of our collective teeth, you made the list! What can I say about this incredibly moving novel, a story about Eleanor as well as Eleanor’s author, a missing laptop and people trying to connect in a world replete with technology but lacking in authentic ways to connect? This is a book of the times that manages to be both experimental and accessible. Lovely. *Editors' Note: Mark did not do the research. Moschovakis may, in fact, be thoroughly devoted to the creative community in Brooklyn, going so far as to even have started a Brooklyn-based publishing collective. However, to this day, Mark breaks out into hives when anyone so far as even mentions a word beginning with the letter "B." If any newspaper that crosses his path includes the word "Brooklyn," his wife must manually snip the word out with a pair of scissors hanging from the mailbox specifically for that purpose. Thus, we're unable to confirm the veracity of many of his claims or fact-check with Mark himself. Reading THE TAIGA SYNDROME is like reading a detective novel from another planet. Things are strange, eerie, off, and yet the reader is compelled to continue. I adore this strange and violent novel that exists on the cusp of consciousness and unconsciousness. Are there monsters? Is there cannibalism? I have no idea. The book is truly unclassifiable. In any event, it would’ve be a real heartbreaker not to include it on my top books of the year. As she is a local professor in Houston, I was able to contact the brilliant Garza by phone. MH: Did you conceive of or write any part of THE TAIGA SYNDROME in Brooklyn, New York? CRG: No, I did not. MH: Have a great day. Dark and grotesque, yet brimming with irreverent humor, this compact book has two halves, both which look at history, art and the human body through its two tales which take place a century apart. Beginning in a sanatorium in 1907 and moving deftly to the art world of Buenos Aires in 2009, Argentine author Roque Larraquy manages to tell a fascinating story that considers science, medicine, history and humanity’s dogged pursuit to move forward at any cost. Roque Larraquy has never set foot in Brooklyn I’m happy to report and although the brilliant translator Heather Cleary is a native New Yorker the last time she was in Brooklyn was for jury duty in 2006. Perhaps this lovely French novel that opens as World War II approaches appears a bit old-fashioned and traditional - I didn’t see it that way - but I was captivated by every single page. It is a story about family, war, love and what it means to be patriotic in the truest sense. It’s strange and generous and the writing is exquisite; a book awash in humanity. There wasn’t a single person I sold this book to that didn’t thank me for it later. In addition, Romain Gary was a character in real life; a dandy, a colorful storyteller who once even challenged Clint Eastwood to a duel in the 1970’s. Is there an author on your list who did that? A musician suspects her husband of cheating and follows him to a strange house in the Paris suburbs. Sounds like a thriller, right? Well Quignard’s book is certainly not a thriller but, instead, an examination of a woman’s life, a meditation on betrayal, lifelong friendships and reinvention. This was my first book by Quignard which I quickly followed up by reading A TERRACE IN ROME. The setting of this book goes from France to the Mediterranean; the writing is stunning and the story never quite goes where the reader suspects. An absorbing and intriguing read that has in no way anything to do with Brooklyn, New York. In fact, I assure anyone who reads this incredible book that not the thinnest, slightest wisps of Brooklyn will enter one’s consciousness.